Ron Fraser, who is paralysed from the neck down. NHS Highland social workers removed round the clock care for Dingwall man Ron Fraser despite the health board’s own assessment that 24-hour assistance is needed, it has emerged. 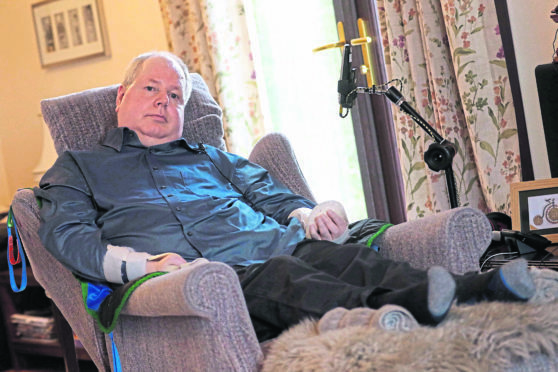 The 61-year-old fears the move to deprive him of round-the-clock care has been made to “force” him into a care home. The information is found in emails to health board chairman David Alston, MSP Kate Forbes, as well as a disabilities advocate and a Self-directed Support Scotland official. Mr Fraser said: “I feel they [the NHS] are trying to force and bully me into a residential care home. How else could you take it when you are dropped from 24 to four and a half hours care. “They have admitted that my 24 hour care needs can be met in a residential home but the bottom line is they are not prepared to fund us at home. That is the whole crux of the matter. Mr Fraser said his big fear is being separated from his family because his wife has “severe back problems” and “she hasn’t been out of the house for months” so moving to a residential home would be devastating. He said: “What we would say it at that we are extremely sympathetic to this family as we are to others in similar circumstances. Kate Forbes MSP said: “We should be moving care into the community so that people can stay at home for as long as possible. “This is particularly important for Ron Fraser who has been with his wife for almost forty years and has family and friends close by. “In Ron’s case, NHS Highland must recognise that he needs 24 hour care and that needs to be delivered in a compassionate and comfortable way.